Only $ 14.95 Includes shipping. Only $14.95 - Order your copy today and be among the first to enjoy this riveting action. 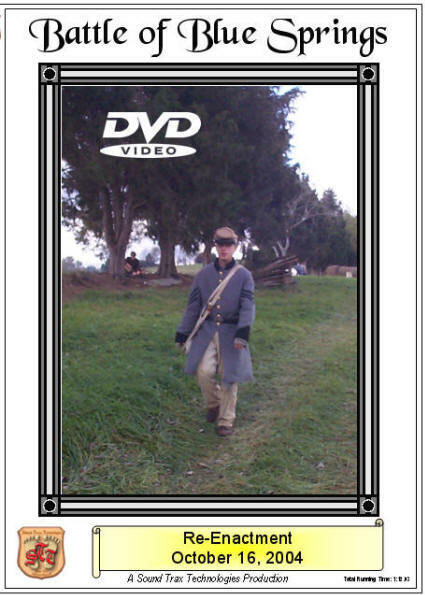 This DVD includes approx one hour of live battle action, followed by a nine minute slide show of the "Still Shot" photos shot during the day by both photographers, Plus two "Old Time, (black & white with enhanced action)" Style shorts, one of the artillery preparation and one of the encampments depicting the lifestyle of the era. Included with the DVD is an insert with the details of the actual 1863 Battle of Blue Springs. The insert includes full statistics, compiled from the "Battle Reports" as reported by both sides. An excerpt from the insert appears below . . .
A Union expedition into East Tennessee, lead by Maj Gen Ambrose E Burnside, commander of the Department of the Ohio. His mission included attempting to secure the saltworks beyond Abington, . . . The rest of the story is in the actual DVD insert. Order yours today . . .
Click on the button at left to order your DVD today!